When my good friend Sharolynn called me from Prince George to tell me she was coming to Kamloops for the Christmas Holidays, I was excited to plan an excursion that would have us being active while still giving us the opportunity to visit. Snowshoeing is quickly becoming a popular Kamloops sport and we decided to give it a try so we drove up to Sun Peaks and rented snowshoes from the Adventure Center in the Village Day Lodge. 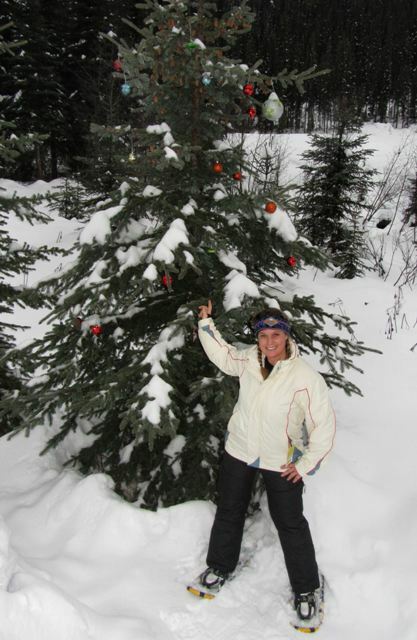 The rental price included a pass for the groomed and marked snowshoe trails as well as complimentary trail map and an interpretive guide booklet. Snowshoes were essential tools for early Canadian fur traders and trappers whose living depended on their ability to get around in deep snow. While the snowshoes of the past consisted of a hardwood frame with rawhide lacings, modern day snowshoes are made of lightweight metal, plastic, and synthetic fabric. We walked across the covered bridge and put on our snowshoes before making our way to the trail head. Neither one of us had ever tried the sport but we both caught on surprisingly fast. For the most part we stayed on the trail but every so often we veered off to get a taste of trekking through deep snow. Camera in hand, we stopped to take pictures of the snow cave, the bird feeders and all the decorated Christmas Trees we discovered along the way. 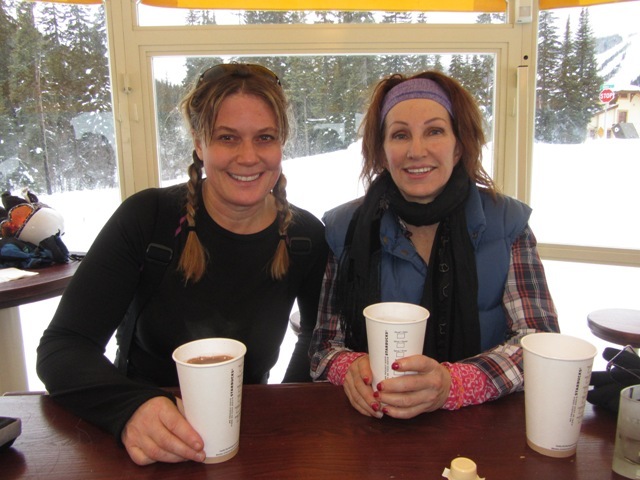 Snowshoeing is a great workout and by the time we made it to the Umbrella Café we were ready to stop for a cup of hot chocolate and a bite to eat. This unique cafe was constructed from a large yellow metal umbrella surrounded by glass and heated with outdoor heaters. With a bar in the middle and seating all around, this little gem not only provides great food with an amazing view, it’s also a social hub for winter fun-seekers. After a few hours our legs were tired and we decided to call it a day and looked forward to trying it again one day, perhaps even going on one of the different snowshoe tours offered at Sun Peaks including the McGillivray Lake Full Day Tour, the Alpine Snowshoe Experience, Snowshoe Golf, and the Snowshoe Campfire Cookout & S'mores.